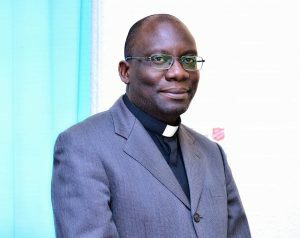 Council of Churches in Zambia (CCZ) General Secretary Fr Emmanuel Chikoya has urged parents going through hardships to share their challenges with faith based organisations such as the Church and relevant NGOs instead of resorting to selling their children. Commenting on the arrest of a 29-year-old man of Nakonde for trafficking in persons after he attempted to sell his three-year-old son for K100,000 and that the boy be killed for rituals, Fr Chikoya says parents and citizens at large must consider sharing their problems with institutions that can help instead of selling their own children whom God entrusted them with. Fr Chikoya has reminded parents that they are just stewards of their children hence have no right to do anything they wish with to do with them. He says money acquired from selling own children would not take anyone anywhere but would instead worsen whatever challenges a parent is going thorough. He says human beings are created in the image of God hence have human dignities which must not be compromised in any way. He says no human being is worth selling for any price. Fr Chikoya has since commended the Zambia Police for their quick response in arresting the offender thereby saving the life of the innocent boy. Meanwhile, Fr Chikoya has commended the Media for digging and publishing news on human trafficking and ritual killings which have rocked the country of late. Commenting on the news article published by the Daily Nation Newspaper about how some people tried to kill a 30-year-old man to harvest his body parts for ritual killings in Mwense, Fr Chikoya says the media must be commended for doing a great service in revealing this heinous crime to the nation. He has since urged law enforcement agencies to take proactive and keen interest in attempted murder cases as opposed to waiting for victims to report to their offices. He says the reported riots, torching and destruction of property in Chipili could have been avoided had the Police done their homework. He says the duty of law enforcement agencies such as the Zambia Police is to protect citizens by maintaining law and order. He has, however, commended the District Police Command for making a commitment to pursue the matter at senior level. And Fr Chikoya has expressed disappointment over the continued fires gutting trading places in the country. Commenting on the latest burning of Chiwempala Market in Chingola, Fr Chikoya says there is a desperate need for the country to find out why and how fires destroying property worth millions of kwacha come about instead of just making quick pronouncements without a lasting solution. He has called on relevant authorities to thoroughly investigate what has been causing the fires and publish the findings for public scrutiny and advice if they have failed to decisively deal with the problem. He says the nation has suffered enough fire outbreaks in which lessons must have been learnt and solutions found. He says a responsible nation cannot allow a perpetual recurrence of fire outbreaks targeting mostly big markets and instead of dealing with the root cause authorities just blame one other at the expense of finding solutions that are needed to protect people’s property. Fr Chikoya says the Church is disappointed as there seems to be lack of seriousness by relevant authorities especially those under the Ministry of Local Government and Housing. He says this problem must be dealt with before it gets out of hand. He says the Church’s prayers go to all those that have lost their property and has called upon the local Churches in Chingola to pray for and offer practical support to the victims of the Chiwempala market fire.